CrystalClear Sparkle fountain cleaner is a revolutionary product designed specifically to keep fountains, bubblers and disappearing waterfall feature clean and clear all year long. 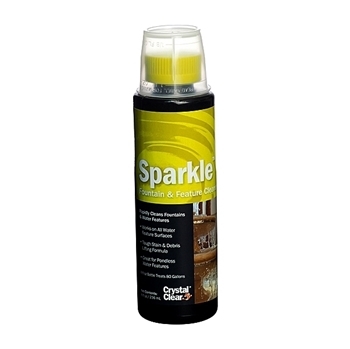 Sparkle helps prevent stains, sludge, mineral deposits and organic contaminants from forming in basins. Safe for us on all makes and models of fountains and bird baths. Use 1 fl oz of Sparkle per 10 gallons. Apply Sparkle once a week. Do not apply Sparkle at any other rate than the rate prescribed above once a week.